CATHOLIC GIFT SHOP LTD - Sacred Heart of Jesus Medal Gift Set with Rosary Beads. Sacred Heart of Jesus Medal Gift Set with Rosary Beads. > Novena prayer card to Sacred Heart of Jesus medal with medal and silver foil stamping. 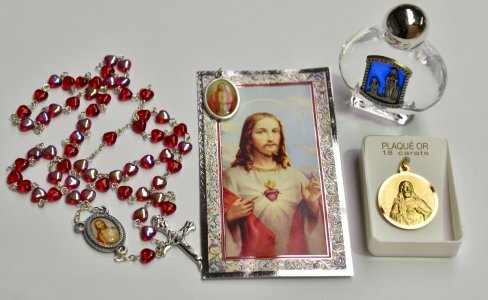 > Sacred Heart of Jesus red heart shaped rosary beads. Glass heart beads measure 5 mm, Rosary measures 18 inches approx.